The correspondent failed to mention how the website is hosted by Environmental Media Services. Noel Sheppard pointed out in a July 2008 item on NewsBusters that “EMS is the communications arm of leftist public relations firm Fenton Communications.” Sheppard also noted the other left-wing connections that the firm has, including links to climate change guru Al Gore, MoveOn.org, and the Tides Foundation. Speaking of Gore, he gave a ringing endorsement of RealClimate.org earlier in 2009. 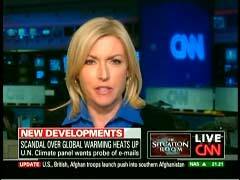 CNN aired another slanted report on ClimateGate back on November 25, but has also aired fair segments, such as Jack Cafferty’s commentary on Wednesday, and Rick Sanchez’s panel discussion on Thursday. WOLF BLITZER: In another story capturing worldwide attention, the scandal over global warming heating up. There’s a fresh twist involving the leak of those e-mails that some say poke serious holes in long-held climate crisis theories. Let’s go straight to CNN’s Mary Snow. She’s got the latest for us. Mary? MARY SNOW: Well, Wolf, a senior U.N. climate official is speaking out on the leak of e-mails between climate scientists, and the U.N. panel he heads is now getting involved. SNOW (voice-over): Two weeks after computers were hacked at the U.K.’s University of East Anglia, and e-mails between climate scientists were posted on the Internet, the head of the U.N.’s climate science body told BBC radio he wants an investigation. RAJENDRA PACHAURI, CHAIRMAN, IPCC: We certainly- we’re going to look at the whole lot, and then, as I said, we’ll take a position on it. So we certainly don’t want to brush anything under the carpet. We don’t want to sweep it under the carpet. This is a serious issue, and we certainly will look into it in detail. SNOW: This U.N. probe is in addition to an investigation underway at the University of East Anglia, which says it’s looking to see if there’s any evidence that scientific data was manipulated or suppressed. Phil Jones, the head of the university’s Climate Research Unit, has stepped down temporarily. Those who question the effects of human activity on climate change have seized on the e-mails, accusing scientists of conspiring to hide evidence and trying to destroy data. Among them, Republican Senator James Inhofe, who has called global warming a hoax. This week, he called for hearings- no decisions yet, and the e-mails were raised at a House hearing this week. REPRESENTATIVE JOHN SHADEGG: Anyone who thinks that those e-mails are insignificant, that they don’t damage the credibility of the entire movement, is naive. SNOW: But at that hearing, a top government scientist said the e-mails do nothing to change the science. JANE LUBCHENCO, NATL. OCEANIC & ATMOSPHERIC ADMIN. : E-mails really do nothing to undermine the very strong scientific consensus and the independent scientific analyses of thousands of scientists around the world that tell us that the Earth is warming, and that the warming is largely a result of human activity. SNOW: Gavin Schmidt is a leading climate scientist with NASA’s Goddard Institute for Space Studies. In the weeks since e-mails were hacked and questions arose, he’s been putting large volumes of data links on the website RealClimate.org, that demonstrates a consistent trajectory of a potentially dangerous warming climate. SCHMIDT: So what we’ve done, as we just said- you know, look- you know, you’re not aware of that data, but here is all the data that’s already existing. SNOW: His name appeared on those e-mails, and he says he has nothing to hide. SCHMIDT: There’s nothing in these e-mails that’s problematic. You know, most of the stuff that’s been talked about has been taken completely out of context, and there’s a lot of nonsense that’s being spoken. BLITZER: There are others though that disagree. We’ll have extensive coverage next week of that summit in Copenhagen. Thanks, Mary, very much.